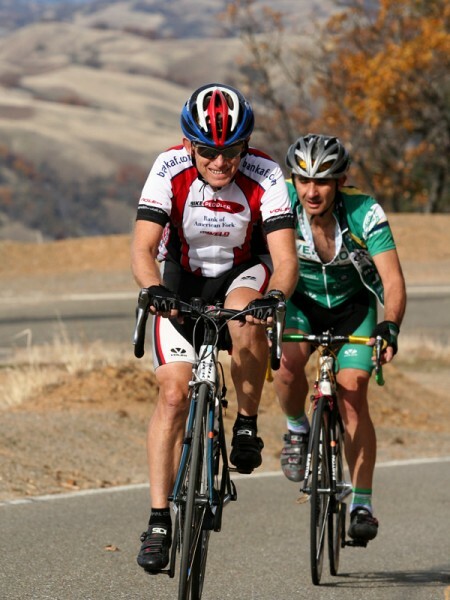 One of the traditional rides on Thanksgiving morning is to make the 19 mile climb up Mt. Hamilton. 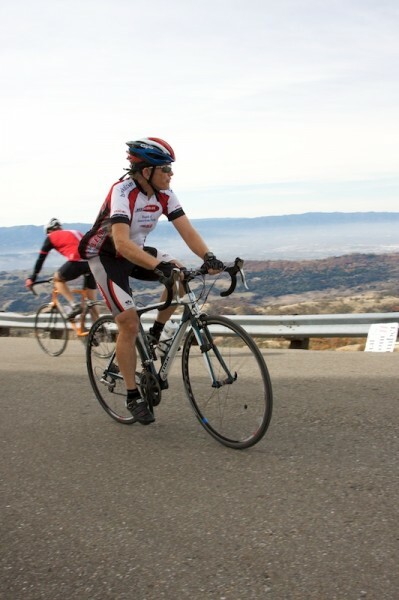 There were two separate club rides up the hill that day, but I wanted an extra challenge so I joined in the race sponsored by the Low Key Hill Climb series. Not exactly “low key”, but neither a sanctioned race. Starting near sea level, the finish is at over 4,000 feet, the highest elevation for any local climb. At the top there is the famous Mt. Hamilton Observatory. With a maximum grade of about 6%, the road leading up is never real steep. To allow the movement of the heavy equipment to build the observatory many years ago, they had to keep the grade from being too excessive. Still, with over 18 miles of racing, mostly all up hill, it is a challenge indeed. There was a very large turnout for the race, the most I have seen at any Low Key Hill Climb race. I arrived around 8:30 when registration was open and we all started soon after 9:30 am. The temperature had warmed up by then so I took off my jacket before the start and carried it for the later descent. I started a ways back in the pack of about 200 cyclists, not wanting to get in the way of the real fast riders. That was a bit of a mistake because I had to go around a lot of riders in the first half mile. But soon I settled down to a fast, but constant rhythm. I noted that my heart rate was hovering around 170 and I started to worry that maybe I was burning myself up. This is above my Lactate Threshold so I would not be able to hold this for the 90 plus minutes of the race. But I felt fine so I kept holding the pace and continued to pass a few more riders. There are two short down hill sections on the course, which allowed for some recovery. 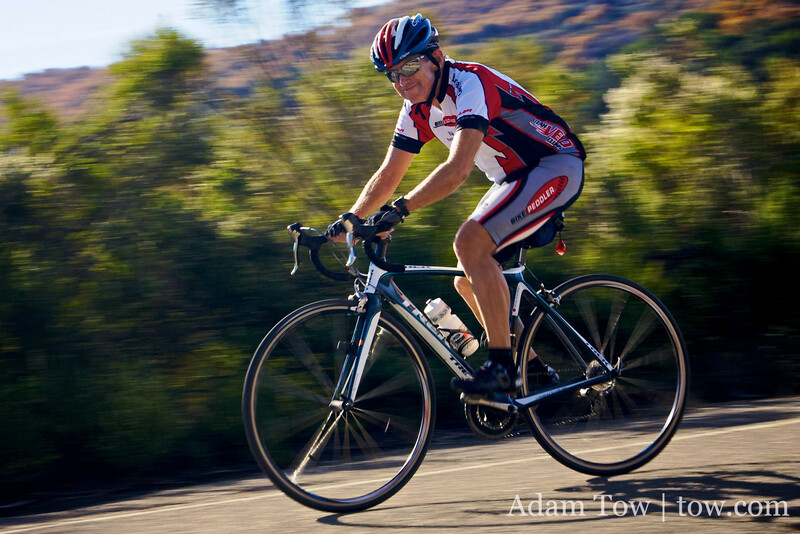 When I was within 3 miles of the finish, I was surprised I had been able to not only keep my heart rate up, but was feeling strong enough to pickup the pace further and start to pace some additional riders who seemed to be suffering from the effect of the long climb. I crossed the finish line at the parking lot of the Observatory with a total time of 96:46. This is a bit less than my official time of 97:03 because I did not start my watch until I reached the intersection while the front of the pact was actually positioned beyond that point when the official clock started. Although this was not my very best time, it was a minute faster than the same race last year, so I was happy with that. When I returned home and downloaded the data from my heart rate monitor I was surprised that for the entire climb I averaged a heart rate of 168, including the downhill sections. That means my Lactate Threshold is something above that, which is remarkable for someone nearly 62 years old. My maximum heart rate during the climb was 176, close to my max heart rate. You can see this on this graph (click to enlarge). When they posted the results I was 86th place out of 152 men and it appears I had the fastest time for anyone over 60 years of age. It is a bit difficult to be sure because this is a low key event and some people make up their own categories, but most use something related to their age. They have a scoring system where you get some percentage of the median time. For this race I got a score of 97.80 since I was slightly slower than the median male rider. When I did the Montebello hill climb race last month, and set a new PR, I scored a 102.15. My biking is not quite up to last year’s level in either total miles or feet of climbing. Last year in the fall I did both the Everest Challenge and the Furnace Creek 508 races so I didn’t think I would do as well this year on the Mt. Hamilton race. Even being a year older and with fewer feet of climbing, I still shaved over a minute off my time from last year. It was a fun event. I was surprised I was able to hold my heart rate at such a high level for so long. I think I might have been able to push even harder but it was Thanksgiving and I wanted to have energy left to eat that big meal. Since I burned over 1,600 calories on the race, I had no guilt eating that afternoon.